When Leo Fender designed the Broadcaster, now known as the Telecaster, he had one goal in mind: Designing the first mass production guitar. In the 1950's, you had two choices when it came to solid body electric guitars: The Gibson Les Paul, and the Broadcaster. The Gibson was two to three times the price of the Fender, depending on the model. The Les Paul had, and still has to this day many design elements that are only there to discourage ghost builders from making fakes. 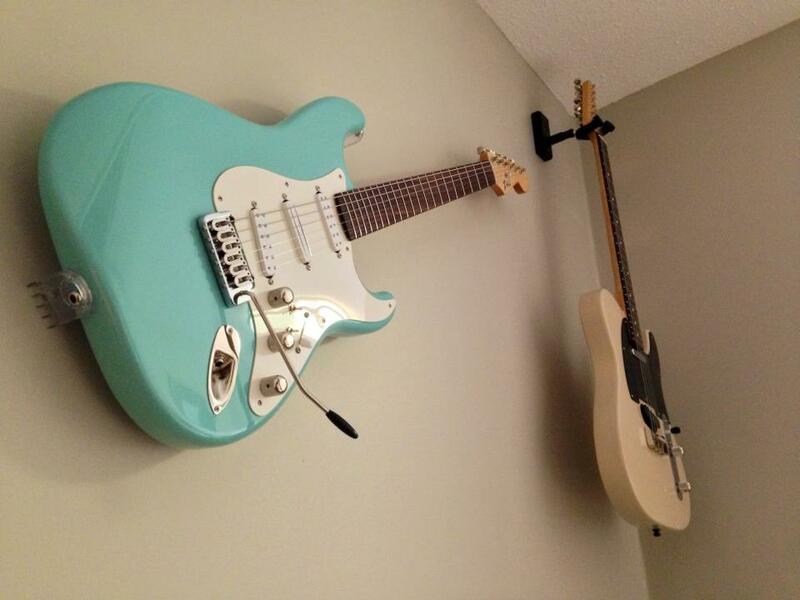 Leo Fender tried another approach. His guitars where to be so affordable that no one would bother building their own. Times have now changed. There are several companies lisenced to make Fender parts today, and if you know what you're doing, you can make a Telecaster that's far superior to anything a guitar manufacturing company can provide. Bellow the pictures in this article; there is a review of the result by one of my professional guitar playing clients. I sign these with my initials, IHW, because I don't make them from scratch, but they wouldn't be what they are without the work I put into them. 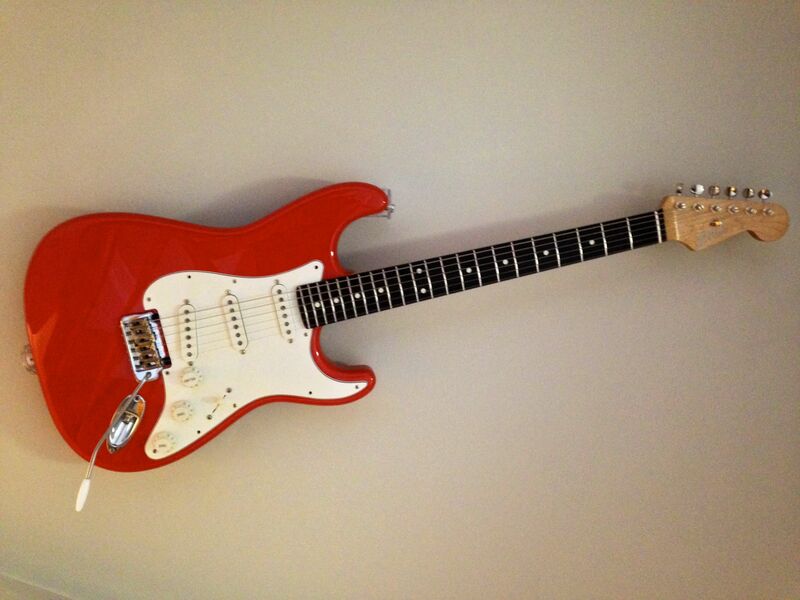 I now also offer a Strat style IHW guitar. I start with unfinished, unfretted necks and a finished body. I apply a proprietary finish to the neck that leaves it feeling completely unfinished, fret the guitar with stainless steel frets, which are buffed to a mirror finish and put the whole thing together. I spend about 15 hours assembling one of these, compared to the 30 to 45 minutes dedicated to assembling a guitar in a factory. The devil is in the details. - 22 AWG unshielded single conductor wire is tinned and stranded, cloth and wax insulator. The Strat Style IHW have the same specs, except for the bridge and pickups. The Strat styles come with a Hipshot Fulcrum tremolo, the best two point, non-locking tremolo available. The pickup configuration is from Symour Duncan: a Little JB at the bridge, a Vintage Rails in the middle and a Little '59 in the neck. Both humbuckers can be switched between series and parallel mode. Please enquire for pricing and availability. “In the world of guitars and basses, it’s the smallest adjustments that make the hugest difference.” This is an excerpt from Ian Weston’s home page on www.ottawaguitarrepair.com. After years of playing, selling and designing guitars, I unequivocally concur. There are certain elements, a commonality that all guitars have and all luthiers have access to: various woods, various hardware/parts & electronics. The craft of guitar building has accelerated dramatically in the past two decades and luthiers are in abundance. So what distinguishes one from another? Within seconds of playing Ian Weston’s IHW “T” style guitar, the answer becomes evident. It’s what I call “The Magic”. Few luthiers and techs possess “The Magic”. It’s the superior knowledge gained only from experience and knowing what works, having a touch and a feel for the instrument rather than just going by the book or relying on what those before you have done or taught you, the meticulous attention to detail truly acknowledging that everything matters and a great instrument is the sum of many factors. All these attributes come through in the IHW, which is even more impressive considering the IHW is a parts guitar. Ian acquires high quality bodies and necks and then applies his “Magic” from there. After spending twenty years in Los Angeles using various techs, including Kenny Loggins’ tech and some of the most highly regarded techs in that music Mecca, then going through three Ottawa techs since my recent return, who knew a young luthier from Quebec now based in Ottawa smokes them all? The one thing that stood out the most for me about the IHW is the phenomenal fretwork. The IHW plays effortlessly, gliding over the fret board with absolutely no resistance or snags. The fret-ends are perfectly smooth and the frets are also buffed to a mirror shine completing an immaculate fret job, fret work that gets out of the way and enhances your playing ability. Given this IHW came with glued-in medium vintage stainless steel frets makes the workmanship even more impressive. Of course this was expected as Ian had previously re-radius’d the fingerboard on my Fender Roadworn Stratocaster from 7.25” to 12” and re-fretted it with jumbo stainless steel frets. The playability and feel is consistent with the IHW. Ian also recently re-dressed the frets on three of my Martin acoustic guitars, which transformed them into something really special. A few years ago I was considering acquiring a Plek machine for a guitar venture. After experiencing Ian’s fret work… well let’s put it this way… David beats Goliath. The IHW’s set–up is also a thing of beauty. Meticulously calculated and player friendly with great attention to detail: just the right action height, pickup height, neck adjustment, number of wounds around the tuning post, nut height, precisely cut nut slots and spot on intonation. Again, given Ian had previously set-up two six string and two twelve string Martin/Gibson acoustics as well as three Gibson Les Paul’s and one Gibson Custom Shop Pat Martino semi-hollow for me to perfection, I was in no way surprised how spectacular the IHW felt yet no less impressed. A testament to the flawless fret work and impeccable set-up on the IHW is the fact I was able to bend three half-steps and two whole-steps with eleven gauge strings on a 25.5” scale length guitar. The last time I was able to do that was at the 2012 Montreal Guitar Show on a Nick Huber Rietbergen hollowbody – good company I think one would agree. This IHW has a swamp ash body, bolt-on maple neck & an Indian rosewood fingerboard with a 12” radius, lemon-oiled providing a deep rich brown colour and protection from drying. Another stand out on the IHW is the raw finish on the maple neck. The last time I felt a neck this smooth and effortless was on my dearly departed PRS McCarty Rosewood Limited, which had an unfinished all Brazilian Rosewood neck and fingerboard. It has been seven years since I’ve come across a neck that felt as good until this neck on the IHW. Ian has a proprietary treatment that protects and seals the wood fibers without any buildup of lacquer or oil on the surface but still allows the wood to breath and retains that silky smooth raw feel. The waterless solution is modified throughout the application process, which takes two days. Then the neck dries for another week before installation. The bonus is the neck became even smoother the more I played it. The feel and silky smooth playability of the neck, in conjunction with the fantastic fret work and impeccable set-up, makes the IHW a real players guitar, effortless, non-intrusive and inspirational. The Kluson style tuners really find the note easily; provide good tuning stability and a solid feel. The bridge is a compensated three-barrel short “Tele” bridge that in addition to providing a different, cool look, allows the bridge pickup to be mounted directly into the body. The IHW also features a hand made bone nut, CTS pots, a paper-in-oil (PIO) capacitor, a Switchcraft 3-Way selector switch, a Switchcraft input jack, Schaller strap lock ready pins and a single ply black pick guard. All top quality parts. The IHW is fitted with two Seymour Duncan pickups: a Vintage Rhythm Tele in the neck and a Vintage Broadcaster Bridge pickup with flat pole pieces. Rather than treat a solid body electric guitar like a hollow body by mounting the pickups on springs where energy losses occur, the pickups on the IHW are bolted directly into the body, firmly mounted, which vibrate with the body and are perfectly balanced. The lack of springs increases sustain and bass since they're absent and unable to absorb any energy. The result is a fantastic sounding guitar that is ALIVE, resonating and vibrating throughout producing tight bass, focused midrange and clear top end. The significant distinction here is the IHW is in no way overbearing like many “T” style guitars can be. The IHW produces plenty of spank and snap one expects from a “T” style guitar yet never rips your head off. Rolling off the tone control yields a wide palette of tones ranging from snappy-spank with plenty of high end when turned all the way up, to a very usable “muff” when rolled all the way down. My personal sweet spot was with the tone control rolled off about 60%. It just provided a warm sweet sound with all frequencies present in all three pickup positions. Although, I found myself using every tonal spectrum the IHW provides. The IHW by Ian Weston has “The Magic”. “The Magic” is something that one must experience to really know the difference. It’s what differentiates an inspirational instrument from a very good instrument. Playing the IHW or even a guitar that Ian has set-up, dressed the frets on, re-fretted, etc. makes you realize why at times you struggled with certain progressions or single-note lines before - it’s because the guitar was in the way. Having played Suhrs, Tylers, Fenders, G&L’s, LSL’s, Nash’s, etc., I can sincerely say the IHW is flat out the best “T” style guitar I’ve played. Ian clearly understands what makes a great instrument is the culmination of multiple facets. The attention to detail he gives to every facet is what distinguishes himself and the IHW from the rest, why look elsewhere? I certainly stopped looking – I just ordered my IHW only with a maple fingerboard and jumbo stainless steel frets. If I could only keep this one until mine arrives. Ian… buddy… a little compassion, please.